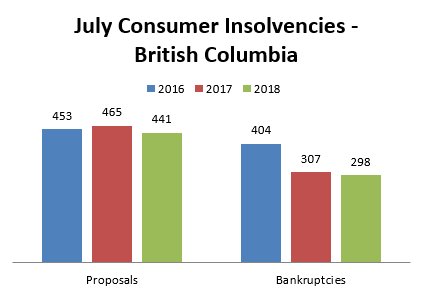 There were 739 consumer insolvency filings in British Columbia (BC) during the month of July this year, compared to 772 in July of last year. This represents a 4.2% year-over-year decrease in insolvency filings. Provincial insolvency statistics are available back to January 2011 and with only 739 filings in July it represented the second lowest number of filings in BC for the period that statistics are available. Nationally, insolvency filings were up by 6.0% in July when compared to July of last year. This is a significant increase when compared to the rolling 12-month national average of filings being up by 0.2%. There were significant divergences when looking at the Provincial numbers. In July, Newfoundland, PEI, New Brunswick, Saskatchewan and Alberta all had double-digit increases in insolvencies; these increases were significantly higher than their rolling 12-month average. In addition, Ontario had a surprising month with an increase of 9.5% in July, compared to a rolling 12-month average of -0.9%. Whether this uptick in insolvency filings is the start of a new trend is still to be determined, however there are several factors which may be impacting Canadian finances. Gas prices have not fallen after the summer driving season, but instead reached a new high of 163.9 cents a liter in October. Rising gas prices are comparable to an immediate tax increase and have a direct impact on discretionary income for most households. To make matters worse, there was a pipeline explosion near Prince George which has impacted FortisBC’s supply of natural gas. Not only will this impact the natural gas prices in the upcoming heating season, but it will also impact vegetable prices in Spring as growers pass on their heating cost increases to consumers. Interest rates continue their relentless move upwards. The Bank of Canada has now raised its benchmark rate from a low of 0.50% to 1.75% with no signs of stopping their rate increases. Higher interest rates have an immediate impact on variable rate mortgages and lines of credit. In addition, anyone renewing their mortgages will be subject to the new higher rates being offered by lenders. The Real Estate Board of Greater Vancouver reported that residential property sales in September were 43% below September of last year and 36% below the 10-year average. Slowing sales has led to moderating prices which means it is more difficult for people to borrow against their homes to finance their lifestyle. In addition, slowing sales impacts the income of people involved in the real estate sector.